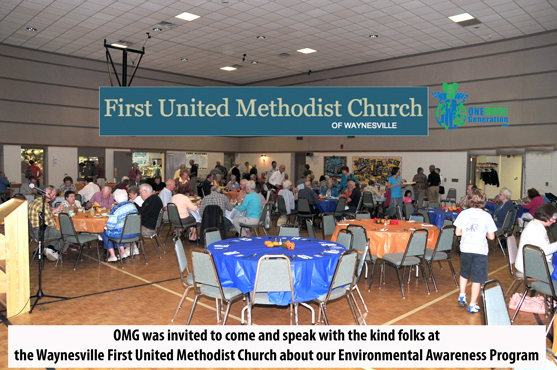 When was the last time your church talked about looking after an endangered species or solving the plastic pollution problem? If you’re like me, it has probably been awhile since that was a topic of discussion at church. 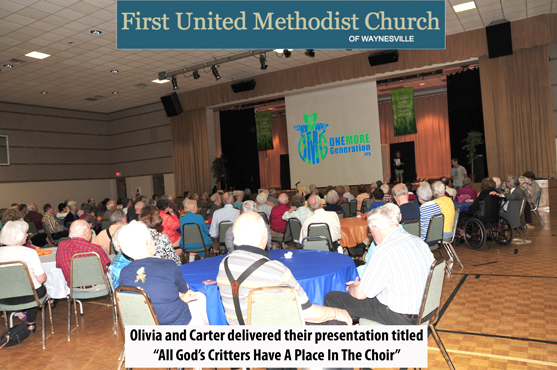 We created our presentation, “All God’s Critters Have A Place In The Choir,” in an effort to help church communities remember our responsibilities and to help them better understand how easy it is to be part of the solution. Most recently, Carter and Olivia spoke with the kind folks at the Waynesville NC First United Methodist Church, where they delivered their message about bringing the focus of God’s creations back into the church’s forefront. With everything that is going on in our world lately and with as busy as we all are, it is easy to forget that we are all supposed to be stewards for God’s creations. It seems that as each day passes, we hear of another major environmental issue or learn about yet another species on the brink of extinction. In most cases, both of these issues are caused by man. 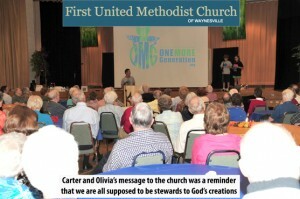 As OMG grows as an organization (and as a family), we are learning more and more about the need to remind ourselves that we are all given the responsibility to be God’s stewards and to look after His creations. We started our organization in an effort to help save endangered species, and as we grow as an organization, we are learning that you cannot help animals survive for another generation without also fighting to clean up the environment. The two go hand in hand. Things like plastic pollution, ocean acidification, and climate change due to our dependency on fossil fuels are all contributing to the demise of God’s creations. Mary Funderburk and the United Methodist Women, along with The Green Team of the Church, invited Carter and Olivia to help get the congregation thinking of ways they can make a difference in reducing their plastic output. 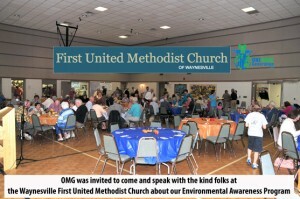 The folks at the Waynesville First United Methodist Church understand the importance of starting a program in their church and community and they are collectively seeking opportunities where they can start making a difference. 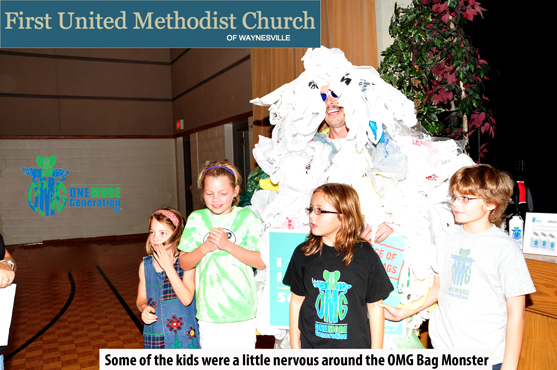 One of their goals is to have their church become 100% Plastic Bag Free in the near future. 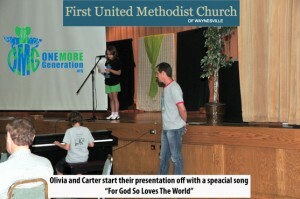 We have created a presentation designed to help the congregation start moving in that direction. The presentation helps churches connect the dots between the effects of plastic pollution with the direct causes of the problem. We have assembled an array of helpful tools on our website designed to help families, churches, and even entire communities find ways to start being the solution to the problem. During the presentation Olivia outlines ways we as an organization have been involved with the various issues and Carter ties that in by reading passages from the bible that help us realize our roles as keepers of all God’s creations. 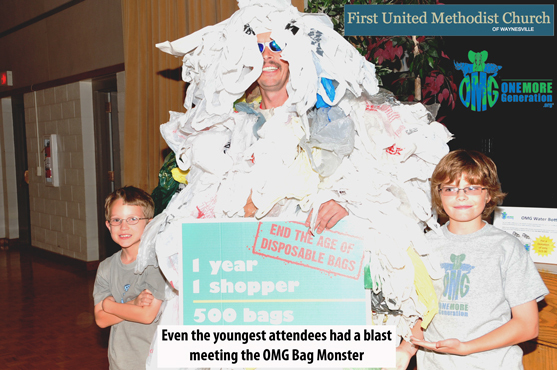 Next we introduce facts about the affects of plastic pollution on our environment and on animals, and then we begin with several simple yet effective steps, which can make an immediate impact on the problem. Steps like bringing your own reusable shopping bag instead of accepting single use shopping bags and purchasing a (non-plastic) reusable water bottle, all have an immediate affect on the amount of plastic pollution we generate in our country everyday. We can further our relationship with God with routine changes in our lives and use our newly formed habits to help protect God’s creations. 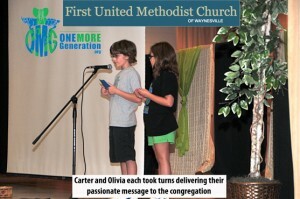 If you are interested in having Olivia and Carter come out to your church, school, or community function to speak and help you devise a program that you can easily adopt, please contact us and we will gladly work out the details. We wish to thank Mary Funderburk, Loy Lilley (Director, Good Word Resource Center at Lake Junaluska) and the Montgomery family for the invitation and for being such kind hosts to our family while we visited your church. You can also visit our FaceBook Page to see all the photos we took during the event and please be sure to “Like” us while your there.